Back in the day the politically well-connected HLGR law firm had 30 attorneys and regular contracts with the state and localities and tobacco companies. They won a $1M settlement from the Oregon Department of Justice for the son of partner Stan Long over the DOJ’s efforts to prosecute him in the first Kitzhaber/Hayes influence peddling scandal. The state hired partners Bill Gary and Sharon Rudnick as lead attorneys for the effort to reduce PERS benefits, and after a pitch to UO about their hiring of former President Frohnmayer, UO General Counsel Randy Geller gave them a lucrative contract for the university’s legal work. Then things started to go south for the venerable firm. 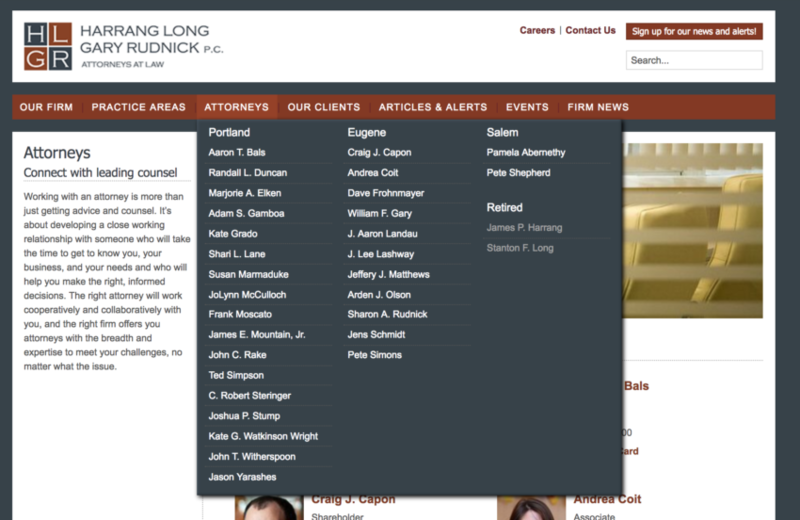 Gary and Rudnick lost most of the PERS case in the Oregon Supreme Court. The City of Eugene replaced their expensive HLGR contract with cheaper in-house lawyers. 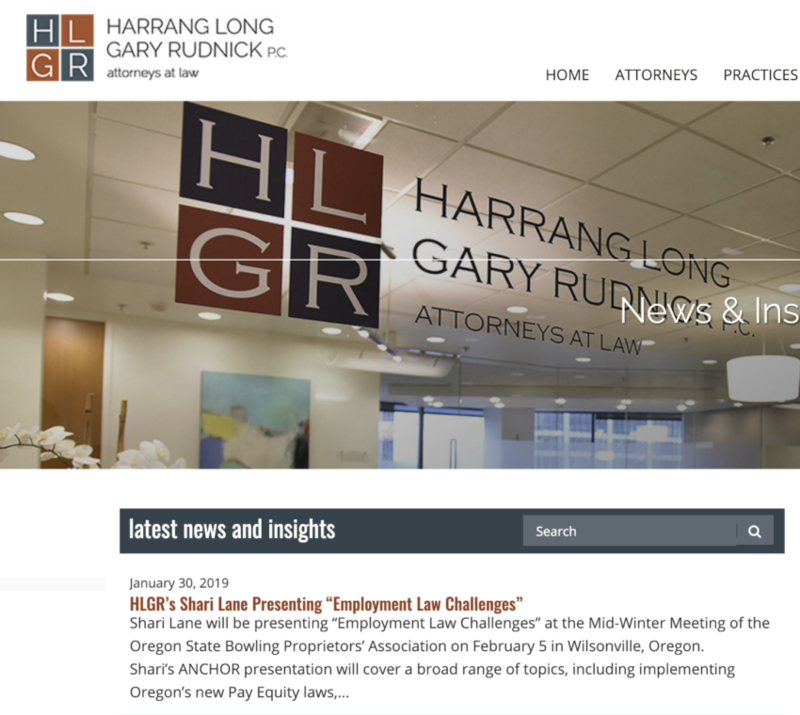 After collecting ~$12K in billable hours defending the Eugene school district from a Register Guard public records lawsuit, HLGR mistakenly emailed the personnel records they’d been hired to keep from the public to the reporter. Whoops. UO had hired HLGR partner Sharon Rudnick to negotiate the first contract between the UO administration and the newly created UO faculty union, but the faculty union’s negotiators – Mike Mauer, Esq and David Cecil, ABD and the faculty negotiating team ran circles around the feckless Rudnick. And who can forget the disastrous GTFF negotiations and strike, with UO’s bargaining team led by HLGR real estate lawyer Jeff Matthews? Then HLGR attorney Andrea Coit, hired by UO to defend against the “Bowl of Dicks” lawsuit from former public safety officer James Cleavenger, accused Cleavenger of wearing a Free Mason’s pin in court to secretly signal his Masonic brothers on the jury. It turned out it was a Duck booster pin, to the amusement of the judge. The jury awarded Cleavenger $755K in damages, plus ~$500K for attorney fees. New UO GC Kevin Reed doubled down, hiring HLGR partner Bill Gary to appeal the fees award. Instead Judge Carter awarded Cleavenger’s attorney another $50K in fees for having to defend against the appeal – and of course UO had to pay Gary’s billable hours too. Ouch. lots of big names gone….to ….where? To not even be included as emeritus or retired? So odd, especially since partners enjoyed ownership of the firm so it is a fairly big deal to just not be there anymore. If the law thing doesn’t work out maybe they can serve up cinnabuns at the mall. A hot cinnabun might even be a better contribution to the University than their legal opinions. You are a petty, evil man. You are no better than the Trump lackeys who say “fake news” out of one side of their mouths while sowing illegitimate discord on the other. I hope you’re proud of yourself, just you and your scotch. Your only friend. You have caused more visceral pain than any successes you could ever claim. God only knows what you have to do to sleep at night. See Mr. Fed Up? Scotch is not my only friend, I’ve also got Dog. Regardless, your malicious accusations are defamation per se, and you will soon be hearing from my distillery’s barristers. Govern yourself accordingly. Ever since that unfortunate Bavarian incident I try to stay away from the beer halls. to the best of my knowledge, the master of this blog now drinks Irish whiskey only. And I have witnesses. He knows that the ‘backstop’ in Brexit will not work and that this is his last chance. Just remember, uomatters, there are good american rye whiskeys, too. Ever since their unfortunate Civil War choice I’ve tried to stay away from Tennessee rye. Well find a rye from North Eastern Tennessee. Most of those counties voted against secession. If you’re unsure and wanting to buy some rye without guilt then check the Wikipedia page for the county of the distillery. Many in Tennessee gave aid and assistance to the Union Army. Some of that aid probably included a few cases of rye here and there. I still think you’re going to be better off drinking single malt scotch though. Thanks for this history. And in any case, if Grant and Sherman drank the traitors’ rye, and they did, who am I to be so particular? Person bowls gutter ball: HLGR offers large settlement, denies fault. It’s a pretty great system they’ve had going, but it couldn’t last forever. Sooner or later someone was going to question why they kept paying full freight for a legal team that never sets foot in a courtroom. After 4j and Eugene caught on it went downhill quickly. UO was just the last of the suckers to wise up, and kept them swimming in gravy for a few extra years. UOM – let it go. Quit gloating about HLGR’s demise. No one really cares but you. Focus on current, relevant UO matters and not something that still sticks in your craw from back in 2013. Water under the bridge – move on. Same with The Hat – dead and gone. Over and done. Over and out.